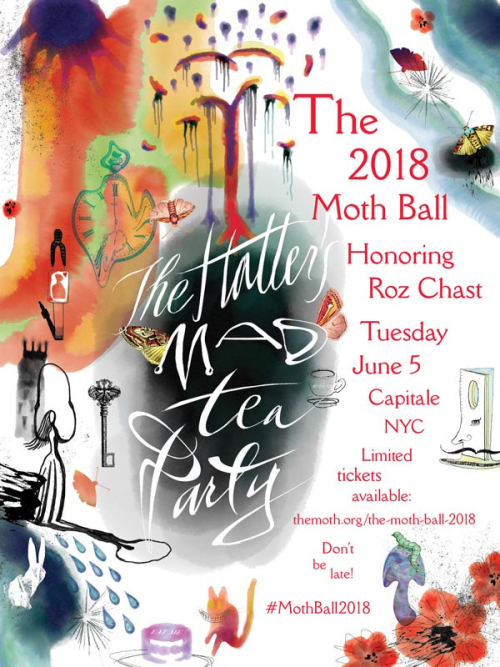 The 2018 Moth Ball honoring Roz Chast @ Capitale. 7:00 pm. $500 per individual ticket/ tables available. Over 500 guests including Moth storytellers and luminaries from the worlds of art, finance, fashion, media and philanthropy will gather to celebrate The Moth with an evening of stories, cocktails and dancing. This year, The Moth continues their tradition of celebrating unique voices with honoree Roz Chast! Attendees of this special event will help further The Moth's mission of honoring the diversity and commonality of human experience through the art and craft of storytelling. Proceeds will support over 550 live Moth storytelling shows in 2018, including The Moth’s Community and Education programs, which offer storytelling workshops and performance opportunities to 5,300 New York City high school students, educators and adults who are too often overlooked by the mainstream media.